Timken® bearings (NYSE: TKR) stand ready to play an important role in helping NASA determine whether Mars ever offered environmental conditions favorable for microbial life. 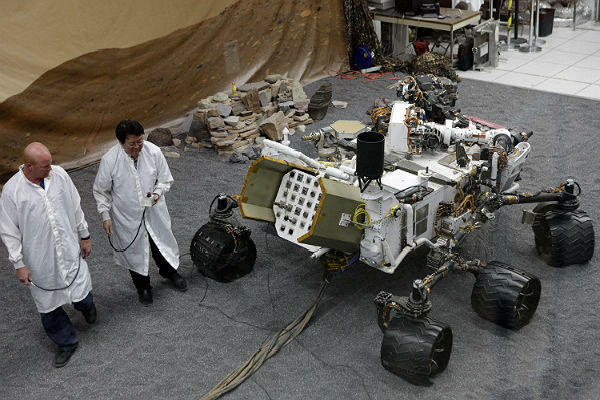 Timken bearings support critical functions onboard the robot—just as they did on two previous NASA planetary rover missions to Mars. After landing on the Red Planet early Monday morning, the Mars rover Curiosity is ready to put its laboratory instruments to work analyzing samples of rocks, soil and atmosphere. Curiosity will analyze dozens of samples scooped from the soil and cored from rocks as it explores with greater range than the previous Mars rovers. Instruments onboard Curiosity include a spectrum analyzer that requires advanced motion control and a miniature pump—both will be involved in the process of collecting and analyzing specimens. The center hub of the Curiosity’s carousel system rotates on Timken bearings, positioning sample cups. In addition, the vacuum pump, the size of a “D” cell battery, supporting the analytical equipment utilizes two miniature Timken bearings with an outer diameter of 0.2500 inches. The Timken Company plant in Keene, N.H., works extensively with NASA and manufactured these miniature precision bearings. The Timken Company (NYSE: TKR; www.timken.com) keeps the world turning with innovative friction management and mechanical power transmission products and services that help machinery perform more efficiently and reliably. With sales of $5.2 billion in 2011 and approximately 21,000 people operating from locations in 30 countries, Timken is Where You Turn® for better performance. Contacts – Media: Dan Minnich, Ofc: 330.471.7760. dan.minnich@timken.com; Investors: Steve Tschiegg, Ofc: 330.471.7446. steve.tschiegg@timken.com, The Timken Company.